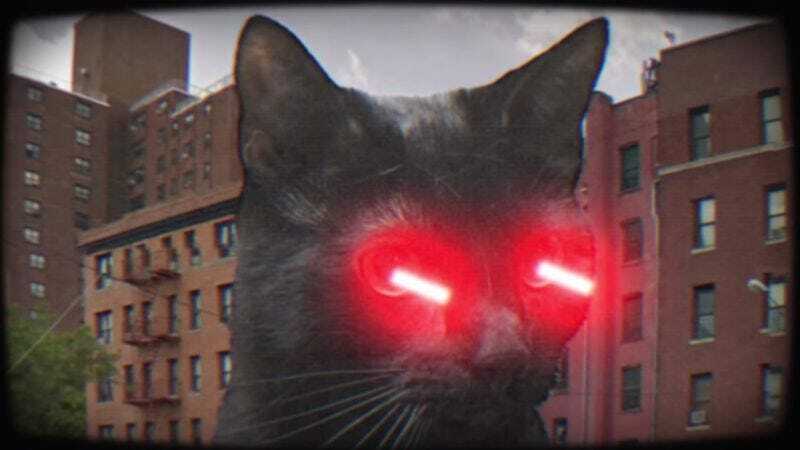 Because an entire album’s worth of remixed cat-rap songs is nothing without a video to promote it, fans of Run The Jewels, kitty cats, or plain old nonsense can now watch a cardboard city get demolished by adorable, laser-wielding felines to the tune of a track from Meow The Jewels. Ably capturing the “this is so stupid that it ends up kind of great” spirit of the project—which, for the woefully uninformed, is a remix of Run The Jewels 2 using noises produced from cats—the video for “Oh My Darling (Don’t Meow) Just Blaze Remix” features two adorable kitties batting at toy helicopters, blissing out on vans full of catnip, and, of course, firing lasers from their eyes. Anyway, in case you missed it, Meow The Jewels is available for free on Run The Jewels’ web site. You can also go there to pre-order the vinyl version of the album—which will feature faux fur on the cover, in what’s maybe the eighth most ridiculous thing about this whole endeavor—with all the profits from the sale going to charity.